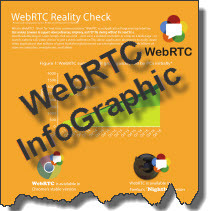 ﻿ WebRTC - Everything you need to know, in one location. Short for “real-time communications,” WebRTC is an open source web API which enables browsers to support videoconferences without the need for a plug-in. Users simply click on a link, such as in an email invite or instant message, to launch a video call or to join a videoconference. This eliminates the configuration and troubleshooting difficulties which can accompany a traditional VC client installation. From a 10,000 foot perspective, WebRTC is a way for enterprises to extend videoconferencing to more employees, as well as partners and externals, by leveraging the desktop PCs, laptops and mobile devices that they already own instead of shelling out several hundred dollars apiece for dedicated endpoints. WebRTC’s click-to-conference ability has enormous implications, positive and negative, for videoconferencing vendors and integrators. 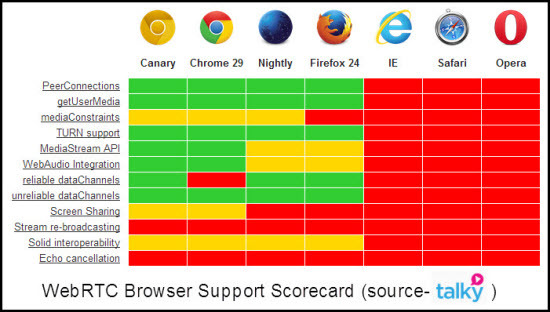 Transforming every Chrome and Firefox (and someday IE) browser on the planet into a video endpoint will likely take some wind out of the sales of hardware VC solutions. On the brighter side, it may also allow for massive adoption and usage to the great benefit of infrastructure and service providers. 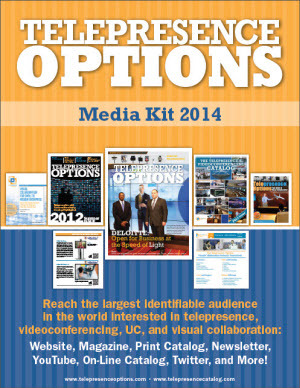 For a deeper dive into this exciting new visual communications technology, please see the feature article “WebRTC: A Reality Check” from the 2013 Telepresence Options Magazine. 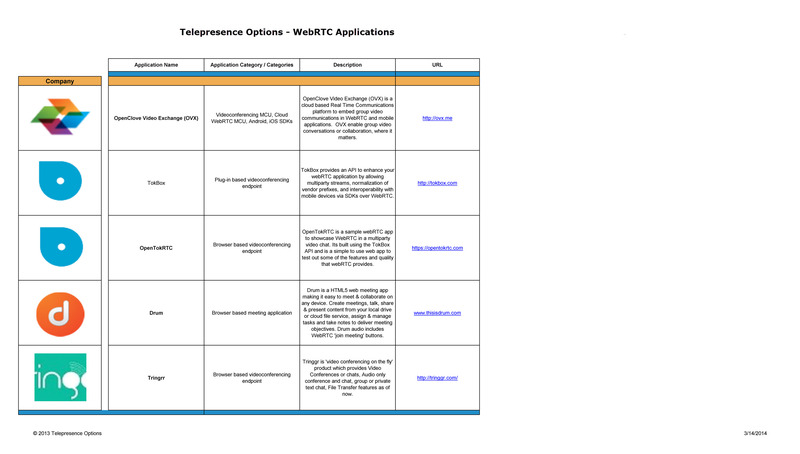 Is your company offering a WebRTC based solution? If you would like to be listed on this page, please fill out this short form. Google’s site for the open development of WebRTC. Want to try WebRTC for yourself? Use the widget below. Simply type in a room name, have a friend type in the same room name in their widget, and you should be connnected! Please contact us to sponsor this page.